Sandgate, a bayside suburb, is 17 km north of central Brisbane. It adjoins Shorncliffe, and both place names reflect their coastal position. Sandgate was named by the surveyor James Burnett after the seaside district of the same name in Kent, England; and Shorn Cliff, also named by Burnett, referred to the cliff face overlooking Moreton Bay. Sandgate is bordered by an inlet, Bramble Bay, on the north and by Cabbage Tree Creek on the south. In 1851 a coastal survey was carried out by Lieutenant CB Yule in HMS Bramble, noting Cabbage Tree Head (Shorncliffe) and a sand bar at the mouth of the creek (also a possible source of the name Sandgate). In 1853 there was a sale of town lots on Cabbage Tree Head. The sale attracted Thomas Dowse, entrepreneur, auctioneer and a future town clerk of Brisbane, who became a forceful advocate of Sandgate until his death in 1885. Having been a municipal borough, Sandgate was upgraded to town status in 1903, and nine years later a handsome new town hall and council office were erected. 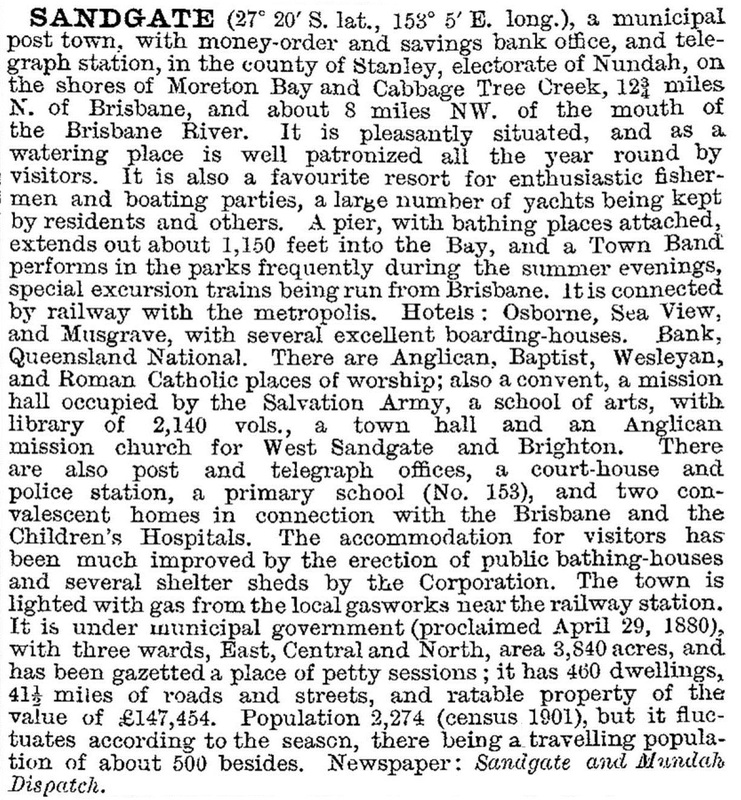 Its area was about seven sq miles, but by 1925 its proximity to Brisbane made it a candidate for amalgamation in the Greater Brisbane municipality. Sandgate was a popular venue for group outings and Sunday School picnics, but was bypassed by freer-spending visitors when the Hornibrook Highway to Redcliffe was opened in 1935. As a result it was less exposed to developmental pressures, and its late twentieth century village atmosphere became an attraction for residents who could commute to Brisbane. Shops and cafes in Brighton Road reflect local tastes and the recreational needs of urban tourists. There is also an extensive foreshore reserve with a swimming pool, and a former water fowl swamp became the Dowse Lagoon and parkland. There are a primary school, a high school in neighbouring Deagon, and a Catholic primary school (1893) and a Catholic college in Shorncliffe. The Sandgate golf course is also in Shorncliffe. The heritage-listed town hall in Brighton Road is in the historic precinct north of the railway station. Other heritage-listed sites include the war-memorial park (1924) in Seymour Grove, the post office (1886) in Bowser Parade and the former Baptist church (1887) at the eastern end of Flinders Parade. Maree McDonald, Sandgate: tides of change, Brighton, Reepete Publishing for the Keep Sandgate Beautiful Association, 1997.